This is a deciduous species of small tree that introduced from Eurasia. Small tree, 5-15 m tall; branches ascending to spreading, greyish; winter buds and young growth densely greyish-soft-hairy. Alternate, deciduous, pinnately compound; leaflets 11 to 15 (17), oblong to oblong-lanceolate, 2-6 cm long, sharp-pointed at the tip, mostly smooth, saw-toothed almost to the base. Inflorescence a flat-topped, branched cluster of numerous (75 or more) small flowers, the branches more or less white-hairy; corollas white, the petals 5, nearly circular, 3-4 mm long; calyces hairy, 5-lobed, the lobes triangular; ovaries inferior; stamens 15-20. Berry-like pomes (like miniature apples), globe-shaped, 9-11 mm wide, scarlet, not glaucous, 2- to 5-chambered; seeds 1 or 2 per chamber. Mesic to moist, open forests, fields and roadsides in the lowland zone; frequent in SW BC, rare northward along the coast; introduced from Eurasia. 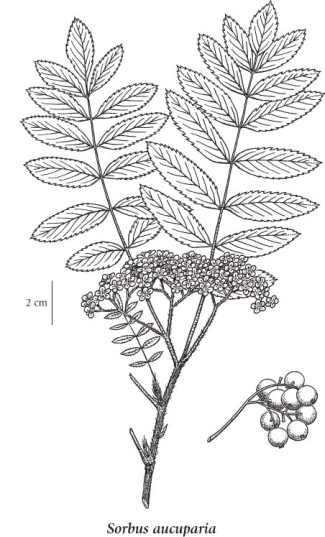 Sorbus aucuparia is considered an emerging invasive species in the Vancouver region by the Greater Vancouver Invasive Plant Council (2009). An emerging invasive is defined by them as: currently found in isolated, sparse populations but are rapidly expanding their range within the region. It is already well-established in the Fraser Delta.